Ion Cleanse in Addison – Dallas TXGet an Ion Cleanse in Addison, Texas at Addison Park Place Salons. Our Ion Cleanse service will detoxify your body and leave you feeling great. Ion Cleanse Services What is it, & how does it work? This is one of the main questions I receive on this service. This is a service, that I must say, has changed my life. It has helped sooo much with pain in my body. And, it got rid of my ‘kankles”! 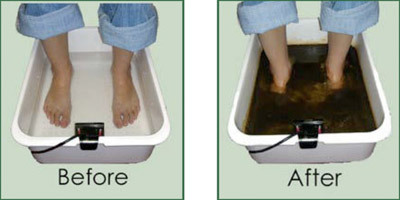 Ion cleanse sessions remove diacetic, lactic, pyruvic, uric, carbonic, acetic butyric, & heptic acids. It also removes candida (Yeast), tobacco debris, cellular debris, blood clot materials, & heavy metals from the body. We are constantly under attack from the environment, the water we drink, the food we eat, stress, & reduced kidney & liver function. By reducing some of the acids, we leave the body in a more alkiline state. And when the body is in a more alkaline state, disease & cancer cannot grow there. It is a PROVEN MEDICAL FACT, not just holistic mumbo jumbo. Ion cleanse sessions only take about 30 minutes. I use a tub of water, a pinch of salt (salt makes the equipment I use run at a higher ampage) & the array that is attached to the processor box. Pop your feet in, relax & enjoy a nice 30 minute rest. At the end of the session, your water will no longer be clear, it will probably be from brown to black! You will have a multitude of debris in your water. After you have had 3 sessions, you will notice a huge difference in your pain level throughout your body. If you do 10 or more sessions, we could maybe, possibly, bump up your time to 45 minutes for added alkilinization. I just don’t like to start out anyone w too much too, so that it does not make them tired the rest of the day. If you are looking for more information on this service, & on the equipment that I use, go to amajordifference.com.